Sophomore pitcher Ashley Iagnemma delivers a pitch during her freshman year. The 2016 KIAC Newcomer of the Year has started her second year 3-2 with a 2.84 ERA and 44 strikeouts. Sophomore Ashley Iagnemma will have the spotlight on her when she takes the mound this season. A strong freshman season made her a standout player for the Pioneers, a role all too familiar to the Point Park softball pitcher. “She is the best pitcher in the conference,” head coach Michelle Coultas said. Iagnemma is seeking the Pitcher of the Year award for the River States Conference (RSC) this year after receiving the conference Newcomer of the Year honor in 2016. She currently leads the conference with 44 strikeouts through her first eight appearances. Iagnemma’s teammates describe her as “friendly, yet determined.” She is no stranger to the field, having played for more than 10 years. Her decade-long career opened her mind and has become the love of her life. The game came naturally to her when she began playing in first grade. In third grade, Iagnemma was moved up to fast pitch, where her pitching career began. It was at this time her mother knew that softball was for her. She joined South Fayette’s High School softball team as a starting pitcher in ninth grade, and played for Team Pennsylvania, an organization that prepares athletes for college competition, for the next four years. During her sophomore year of high school, Iagnemma began questioning if softball was worth all the work. She did not have the free time like her friends, as she was spending every weekend at traveling team tournaments. Iagnemma strived to balance what she loved with who she loved, ultimately making the decision to continue her softball career. In 2014, Iagnemma had the greatest accomplishment of her career at the end of her junior year. South Fayette won its first section title in school history, following a playoff game against Trinity High School. Iagnemma posted a complete-game shutout, homered over center field, and struck out 13 batters in the 10-0 win. During her senior year, Iagnemma officially signed to Point Park to continue her softball career. She reached her 500th strikeout that season, becoming the first player in South Fayette history to reach that mark. 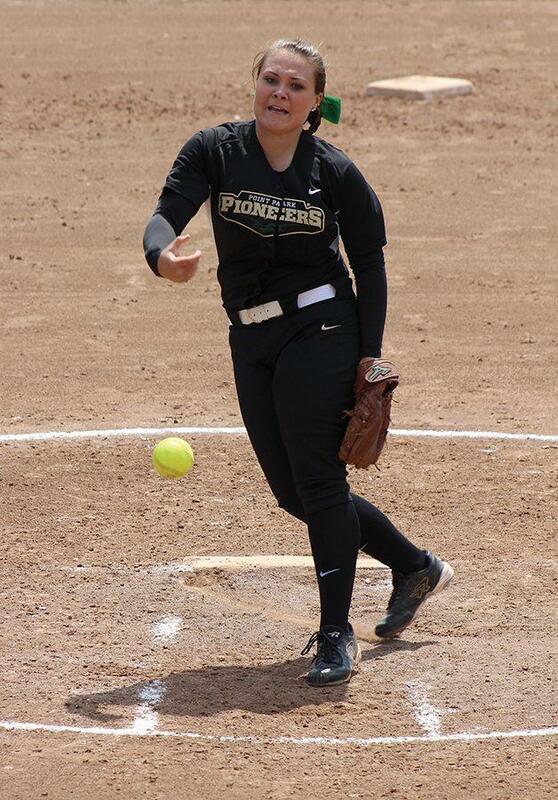 Iagnemma struck out 153 batters in 133 innings pitched during her freshman season at Point Park, posting a 2.16 ERA. Her efforts helped her achieve the conference’s Newcomer of the Year honor. Teammate Shanon Davis knows that when the team takes the field, Iagnemma is looking to win. Fellow pitcher Tiffany Edwards said she has 100 percent trust in Iagnemma when she steps onto the field, and knows she will perform at her best every game. Iagnemma said softball is her true passion in life, and that she probably would not be in college if she never started playing. Coultas believes Iagnemma is a strong contender this year for Pitcher of the Year. Her team posted a 23-19 record in 2016 with a 14-4 conference record. Point Park went 5-8 during spring break in Florida to start 2017, and will begin RSC competition on March 25 against Carlow. Iagnemma has gone 3-2 with a 2.84 ERA to start her sophomore season with four complete games in six starts. Stacy Iagnemma could not be more proud of her daughter’s softball successes.